You will find this delicious soup all over the internet! 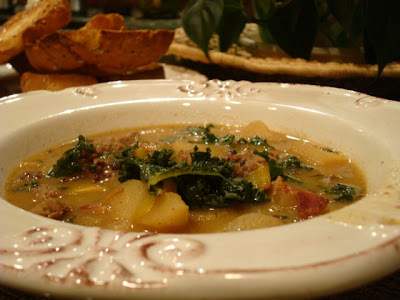 I think every recipe blog has tried this soup and reviews are unanimous! DELICIOUS!! I can't remember where I originally came across the recipe but Brenda has posted this recipe on her blog Brenda'sCanadian Kitchen. Brenda has a fabulous blog and if I'm searching for a recipe, I will usually head on over there first! The recipe is supposedly a copycat of an Olive Garden recipe. I haven't tried the soup at the restaurant so I can't compare. Trust me though, it's very good. Hubby loves it and he says.... "this is a keeper, you can make it anytime"
Crumble sausage into a dutch oven over medium-high heat until cooked through and no longer pink. Drain and set the sausage aside. Chop onions and dice bacon; add to the Dutch oven. Reduce heat to medium and cook until onions soften and bacon begins to crisp. Add minced garlic and cook for 1 minute. Slice pototoes in half lengthwise and cut into 1/4 inch slices. Add chicken broth and cook for 15 minutes or until potatoes are almost done. Add the sausage and kale and let simmer for another 5 minutes or until kale is wilted and soft. Add heavy cream, simmer for 5 minutes, but don't boil. Serve immediately. Brenda has a wonderful Buttermilk Herb Bread recipe to compliment this soup. If you try the recipe; leave a comment and tell me what you think!